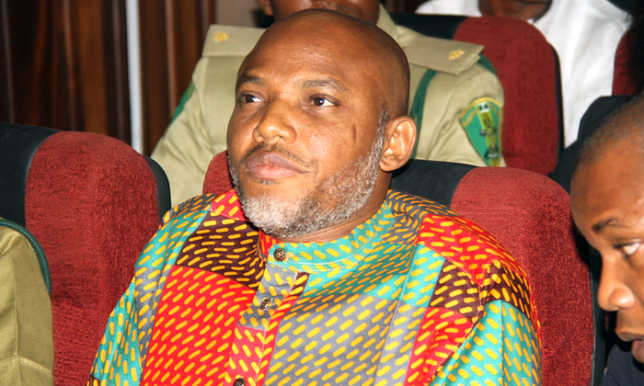 Some people have criticised the leader of Biafra Agitation, Mazi Nnamdi Kanu, over some alleged ill-consultations of prominent people in Biafra territories before embarking on the agitation for the restoration of Biafra as a Republican Sovereign State. They posit that all the ethnicities that make up Biafra were not duly consulted before the engine of agitation was ignited. Some compare Biafra as declared by Late Col. Chukwuemeka Odumegwu Ojukwu with Biafra as pursued by Nnamdi Kanu, and they say that the latter looks more like an Igbo affair as only few people from other ethnicities are showing up unlike the Ojukwu's Biafra that had a handful of all ethnicities. To make certain that all ethnicities in Biafra concurred to the Biafra ideology, it is true that Ojukwu (of blessed memory) consulted the different ethnic nationalities that make up Biafra before embarking on secession declaration and as a result of such consultations and the consequential consensus reached, he garnered much considerable support from each of them, to such extent that they synergistically fought for survival. I shall not fault the people Ojukwu consulted for their inability to envisage war as a possible response from the irrational and wicked British-backed government of Yakubu Gowon to their declaration for freedom but I shall blame the brutal activities of Hausa-Fulani that necessitated the declaration a matter of exigency. Because at that time, Biafrans, especially those of the Igbo extraction, were badly killed in the North, in what was termed a counter-coup but which escalated to ethnic cleansing. It is true that the Easterners through Ojukwu immediately went into treaties with the Hausa-Fulani through Gen. Yakubu Gowon but the latter reneged on their resolutions resulting to further consultations with fellow Biafrans on the next move to stop the bloodthirsty Hausa-Fulani from exterminating the Easterners, which eventually led to the declaration of Biafra Sovereignty on the 30th of May, 1967. The people who criticize Nnamdi Kanu may not have seen the differences between him and Late Col. Chukwuemeka Odumegwu Ojukwu, or they might have seen the difference(s) but have deliberately embarked on such criticisms to either instill exasperation on Biafran elites and populace who have bought into the ideology, or they want to garner some cheap popularity and secure some opportunity to eat the scrumbs that fall off their masters table. Such people are blind to the fact that in the time of Ojukwu, Nigeria was militarily under regionalism and Ojukwu was the Governor of the whole Eastern Region. The critics fail to understand that Ojukwu being the military governor of the region had some leverage to make such successful consultations. And the people he consulted were more of his military colleagues who, apart from following orders, can be said to be more united in purpose than civilians. Have you thought of what your personal response could have been if you were one of the elders, traditional rulers or political office holders that the military governor threw the plan to exit Nigeria, as the last resort to the continued massacre of your fellow Easterners in the North? Would you have rejected it? You are a reasonable fellow if you would have supported exiting Nigeria and constituting a separate State of Biafra in order to save your race from annihilation but the same can not be said of the present political slaves we have in Biafra land today, who not only do not speak against the killing of their brothers and sisters in the North but also do order the killing of their own brothers and sisters in their own States, who voted them into offices, assuming they didn't rig themselves into the offices. The same reasonable action can not be demonstrated by the same governors who can not protect their own people against Fulani Herdsmen's attacks even when the attacks have been pre-warned. The same priority can not be demonstrated by our elites who prefer protecting their political offices, businesses and ill-gotten wealth to protecting, defending or speaking out for their own people. The crop of political jobbers and slaves we now have do defend Hausa-Fulani even when they are the perpetrators of violence. These politicians allow their personal interests overshadow a collective benefit. It is true that If they should venture to protect, defend or speak out for their people, they would be susceptible to DSS & EFCC attacks, I see filthy lucre as their major drive, if not, like Ojukwu, our politicians should have been the ones leading this Biafra Agitation. No, they prefer advancing their political careers in Nigeria at the detriment of their people. They prefer supporting their Hausa-Fulani political parties and decisions than enforcing their personal convictions. For example Gov. Rochas Okorocha, during President Goodluck Jonathan's administration, advocated for the devolution of power at the center (Aso Rock), empowering States to have more power than the federal government. In his lecture delivered at the University of Nigeria, Nsuka, he described Nigeria as one of the children suffering from kwashiorkor during the Biafran war, with protruded stomach and big head but tiny legs. He posited that the legs are so tiny to carry the whole body. But today he is not part of those clamoring for restructuring simply because his party does not believe in it. The regional government he supported is now a closed chapter. Now, seeing that the country is no more running as a regional government and Nnamdi Kanu is not a political office holder or leader or a top military officer, how do you want him to facilitate consultations of elites who are comfortable with their positions, influences and affluence? Don't you think that they would have ignored him and called him names had he ventured to consult them? Don't you think that they would have planned his execution as his person would have been a threat to their political chicanery? Although he consulted the elders and formed Bilie Human Rights Initiative, the disease in Nigeria politics seemed to have infected them. Since the method could not work with the Nigerian government being undemocratic and uncivilized, Nnamdi Kanu invented another method that may not have been used ever. All the freedom fighters I can remember were all involved in their countries' politics except a few who I don't remember their existence. Be it, Nelson Mandela of South Africa, he was a politician and was involved in the government. Jomo Kenyatta of Kenya was the Prime Minister between 1963-1964 before he became the first black president of Kenya in 1964. Nnamdi Azikiwe of Nigeria was equally a politician who worked for the independence of Nigeria from Britain. George Washington, one of the Founding Fathers of the United States, was an American politician and soldier. But Nnamdi Kanu does not want to associate himself with the dirty game of politics as played in Nigeria rather he deployed a means of gaining the acceptance of the Biafrans. He went to open a radio station abroad and started unifying his people that 'divide and rule' of Gowon affected. On consultations, he intelligently went to Biafrans abroad to consult and seek their support, knowing that most Biafra elites residing in Nigeria must have been blindfolded by the crumbs that fall off Hausa-Fulani's table hence could no longer reason like Ojukwu. Now that he has been accepted by all and sundry after spending some testing time in the gulag of Nigeria, it is time for such consultations on the best way to lead the people of Biafra to their Promise land and I believe he has visited and consulted some elites in Biafra land since he came out. I want to conclude by saying that the drum beat determines the dance step. If Nigeria were a civilized country, Nnamdi Kanu would not have chosen the methodology he employed in this Biafra Agitation. Look at a civilized country like Britain and see how Nicola Sturgeon is leading her people out of Great Britain.